India style skirts, curls in hair, nose rings and something I called the pumpkin dress are in fashion here in Bangkok, Thailand. Fashion is more important than food to people. 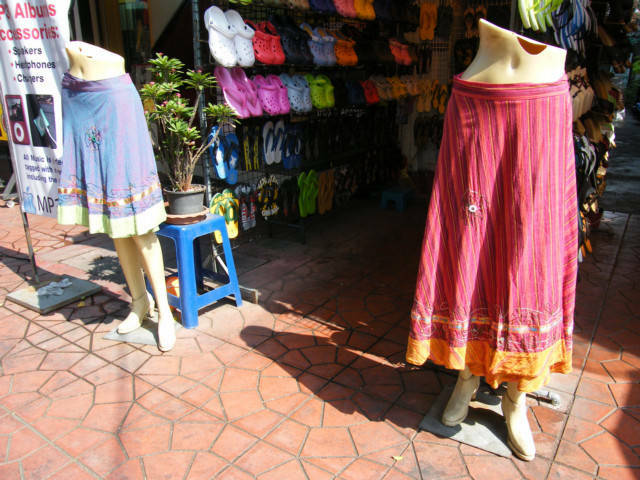 This is some India style or something skirts they are now selling in the Khao San Road area of Thailand. There is also a new dress I call the Pumpkin Dress, whereby the bottom has elastic can pulls tight and up on the legs. The Thailand girls then walk around in typical Thai style of walk a small walk, often now with high heels. I have been trying to take a photo of this with out annoying the girls, I will continue to work on this when I return to Thailand, taking photos of girls is a good hobby. Nose rings are appearing on the faces, there is this head band around the head of many, and the straight hair of girls is being replace by curls. This is about the same as the big noses on the foreigner, some of these things just are everywhere and hard not to notice. I think about Fashions all the time, I am not fashionable, however an observant person can see, fashions continually change around the world in a globalization way. I not sure, I think there are some girls out there who want to know what the other girls on the planet are wearing. I am sure the TV Fashion channel is not on target, however this maybe is the real fashion. They way the Thailand girls copy the Japan girls fashion.